The EUISS together with the German Marshall Fund of the United States and Stiftung Neue Verantwortung, and in cooperation with the Austrian Presidency of the Council and the European External Action Service organised an expert meeting on the application of existing international law in cyberspace. With two panels bringing together both governmental and legal experts, this event focused on the current debates and state practice concerning transparency in cyberspace. 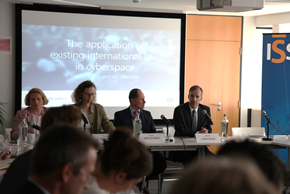 This event was organised as part of the EU Initiative on International Law in Cyberspace (IIL) implemented in the framework of the EU Cyber Direct project. Over the next three years, the IIL will deliver legal capacity building, awareness raising, and training activities.